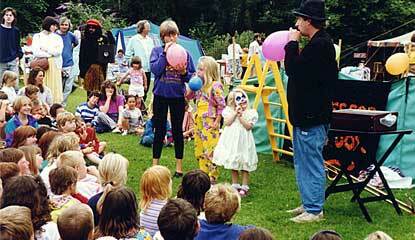 Looking for a children’s entertainer in Dorset or Wiltshire? Professor Paradox, award winning party clown and theatre in education performer is now available for children’s parties in West Dorset and South West Wiltshire. Using his unique blend of slapstick, storytelling, magic and clowning, the Professor’s shows have brought laughter to tens of thousands of children over the last twenty five years. His shows are an unusual blend of magic, storytelling, slapstick and sillyness that will have audiences of all ages laughing and wanting more. If you’re looking for a children’s party entertainer or someone to entertain at a family event, in Dorset or south West Wiltshire, then look no further. Professor Paradox can be relied on to make children laugh, and make your event one to remember. Check the events link for more details. In addition to his work as a childrens entertainer for events in Dorset and Wiltshire, Professor Paradox also has a wonderful educational science show for primary schools. use the education link above to find out more. He also has a Christmas Party show – this gets booked up early for the last week of term so its worth booking well in advance. Professor Paradox has shows for schools, village halls, fetes, celebrations, small arts festivals, and other events where families and children gather to have fun. He doesn’t do big noisy fun days, but if you are planning a community event, then check out the events page for more information. If you are looking for a children’s entertainer in Dorset or Wiltshire, Professor Paradox may be the performer you are looking for. And if you are looking for a themed show specific to an area of Dorset or Wiltshire, then give the Prof a challenge to come up with something suitable. Children’s Entertainer Dorset. Looking for children’s entertainers in Dorset? 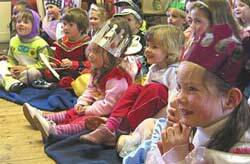 Professor Paradox provides spectacular children’s party entertainment in Dorset including the following towns: Blandford, Bridport, Dorchester, Gillingham, Shaftesbury, Sherborne, Weymouth, and all the villages in the area. Childrens Entertainer Wiltshire – Looking for children’s entertainers in Wiltshire? Professor Paradox provides Great entertainment for children’s parties in the following areas of Wiltshire: Bradford on Avon, Radstock, Trowbridge, Warminster, and the villages in between.